LOCATION: east side of Friendsville Rd. (CR-35); south of Chippewa Rd. (CR-50); in a wooded grove up on a hill in back of a field; about 500 feet from the road. 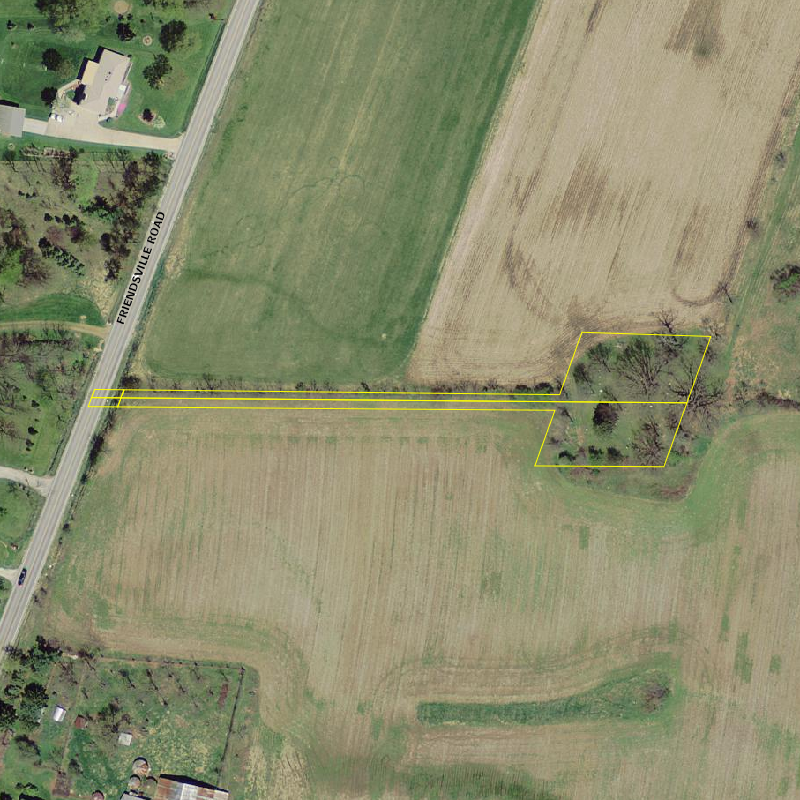 ACCESS: public; the cemetery has a 16-foot wide unmarked legal right of way which follows the fenceline that goes to it. Currently there is no place to park and visitors will need to ask permission from a neighboring residence for parking. While this ground has long been known as the Crush cemetery, there is no evidence that it was ever anything other than a public cemetery. The Crush family arrived in Medina County in the spring of 1823, settling in Westfield township at a time when there was not a house to be found in Lafayette. On September 13, 1837, Orlando Crush purchased 11 acres of land in Tract 3, Lot 11 from Shubel Chapman. This land was located slightly west of the cemetery – but in the neighborhood – and would be the first of several land purchases that Orlando would make. On May 22, 1849 he purchased slightly over 63 acres from Urial H. Peak (Volume 1, page 314). Included in this transaction was the north half of the cemetery. It was Mr. Peak who owned the entire cemetery property at the time when it was started. The first known burial was Shubel Chapman’s daughter, Lovisa, in April of 1836. His wife Polly would follow in September of 1839. Calvin Phinney would bury his wife Thankful here in February of 1840. After that time there were a fair number of burials through the 1840’s though not a one that can be linked to the Crush family until Orlando’s niece Sarah was interred in February of 1851. All told, of the over sixty found buried here, only ten are known to be related to the Crush family. Interments were steady through the 1860’s after which time they sharply tailed off. The Crush property was seized by Ohio Farmer’s Insurance Company in 1890 and sold to Christopher and Mariette Clifford in 1891. 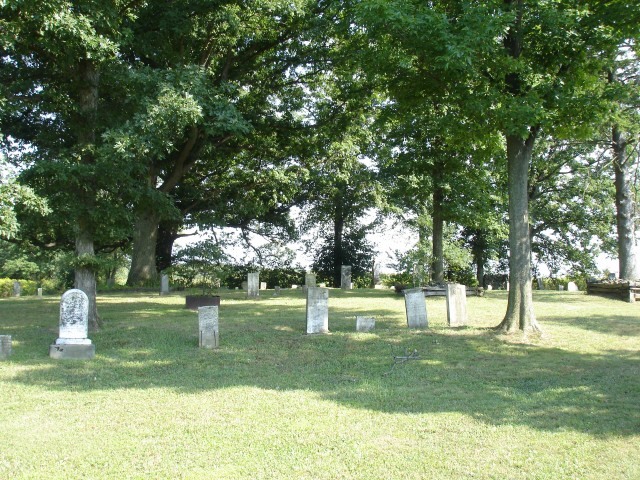 The cemetery land was acquired by the township of Lafayette in two parts; equal half-acre parcels each containing half of the cemetery and the lane leading up to it from the road. Due to vandalism and neglect this cemetery has lost much of its identity. As recently as the mid to late 1990’s, it sat in a state of major disrepair with waist-high thorns and weeds concealing mostly fallen and broken headstones. Evidence of vandals – both man and beast – could be found with broken fences allowing stones to be toppled and later trampled. Many of the stones lying on the ground were eventually concealed just under the topsoil with more stones continuing to be found even today. At this point it is nearly impossible to tell how many rows there actually were and most of what stones remain have long since been moved from their original location. No lot markers can be found and the remaining footstones have all been moved around as well. It is to the credit of the Queberg family, living on the property north of the cemetery, that this old burial ground is presentable today. The cemetery was cleared of debris, mowed, and a flagpole installed. 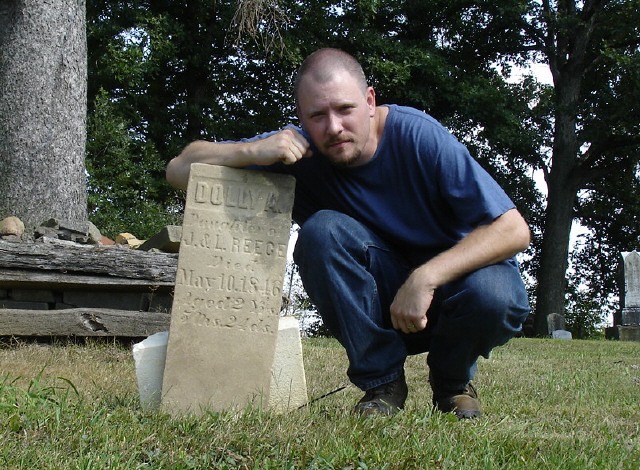 No original records exist for this cemetery. The only burial information available has been compiled from the remaining headstones and a couple of death notices in old newspapers. The WPA did do a map of the cemetery but the lack of any real details would seem to indicate that this cemetery has been in a dilapidated condition for quite awhile. It shows sixteen uniform rows of exactly fifty graves each but nothing more. The WPA listed no veterans in this cemetery even though the grave for one is clearly marked with a military style headstone (J.W. 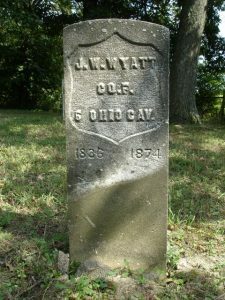 Wyatt, whom they incorrectly listed as being in Waltz cemetery).